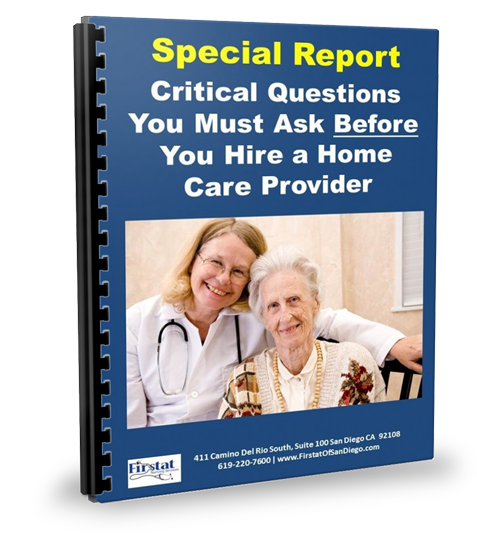 Firstat Nursing Services, a home health agency in San Diego providing home nursing services has recently published a guide on how home nursing can keep peace in the home when caring for an aging senior. Improved Care - One of the main benefits of hiring home nursing care for an elderly or aging family member is an increase in the level of care. More often than not, when a child or sibling tries to care for an elderly family member, the level of care suffers. Even the most well intentioned family members find it difficult to compete with the hard will of a stubborn relative that resists help. A home nurse solves this problem by providing assistance characterized by objectivity and expertise. Who can argue with the recommendations of the expert? In addition, typically, the skills and knowledge that go along with the profession far outpace those of even the most committed family member, making it more likely that a loved one receives the best care. The result- objective, reliable and improved care for your loved one that you can trust will be complete, safe and administered without a fight. Improved Mood - No one enjoys spending time with someone who is constantly complaining or resentful of having to care for an aging family member. Having the assistance of a home nurse even a few days a week can significantly improve the overall mood in the home - of both caretaker and senior. When a friendly, energetic, refreshed nurse arrives, the petty, insignificant squabbles seem silly. A home nurse can bring a new sense of energy into the home, providing cheer that goes beyond a smile and a sense of optimism that is more than welcome. Maintaining Independence - Provide a senior the opportunity to maintain his or her independence and keep peace in the home instantly. Growing old can be a depressing experience if challenges are not met with the right preparation and guidance. A home nurse has the ability to help your loved one deal with these experiences gracefully, without resentment or anger that often accompanies difficult challenges. In many cases, family members are too close to the situation and cannot appropriately provide guidance without assuming control or unknowingly denying seniors the chance to “fend for themselves” when appropriate. A home nurse has experiences dealing with these potentially explosive situations, and can effectively keep the peace. Caring for an aging senior in the home is a difficult challenge for everyone involved. Arguments, tests of will and even resentment can create an uncomfortable, unhappy home environment that does no one any good. Consider a home nurse for keeping the peace and experience improved care, improved mood and a better quality of life for all.